Strongly disagree on Lerner as essentially neoclassical. 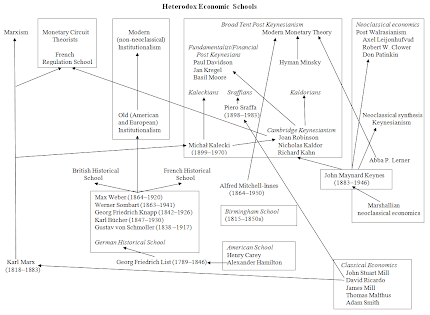 There should be an arrow from Keynes to him - Lerner attributed the main ideas of functional finance to Keynes. And from him to Minsky - Minsky characterized his relationship to Lerner as - "not quite a student" - obviously meaning it was not far from that. 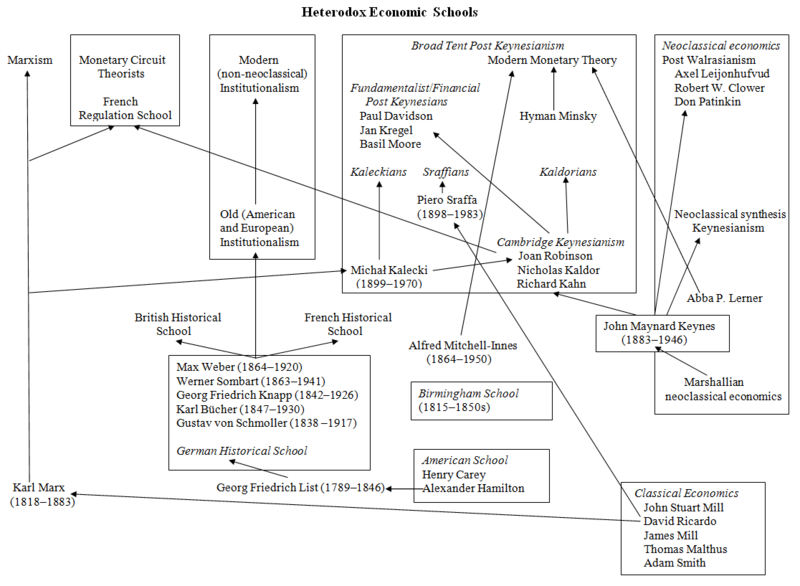 I would probably put a link from the classical economists to Proudhon and then to Marx. Proudhon was a well known and respected socialist economist who -- wherever Marx would have liked to admit it or not -- had an influence on him. That Marx considered him a threat can be seen by the lengths he took to mock and discredit him in "The Poverty of Philosophy" (a work whose few serious points as lost are among the distortions Marx inflicts on his readers). I should also note that Proudhon was considered important enough for Walras to write a book against him -- given that many Marxists assert that neo-classical economics was developed in response to Marx's work, this is ironic (and it should be noted that there is no evidence that any of the founders of neo-classical economics did do). As can be see, there is an appendix on Marx and Proudhon. An updated one for the Post-Keynesian page would be good too. However, I've got no idea how to upload it to Wikipedia.